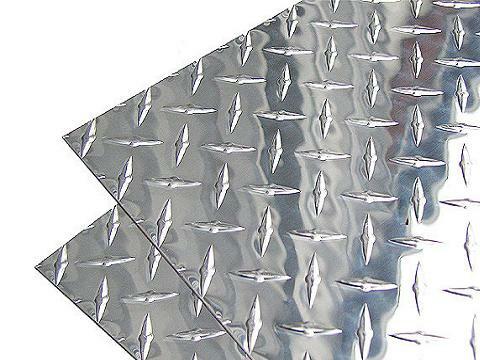 As we all know, the aluminum tread plate has a widely usage in furniture and traffic facility. Such as refrigerators, air conditioners, cars, platform, packaging line, screen frame, all kinds of hanging beam, desk feet, decoration lines, handle, line tube and cover, chair tube and so on. But the leading role of this article is five bar aluminum tread plate pattern. Five bar aluminum alloy tread plate is also named as willow-leaf-shape aluminum tread plate, Because the pattern on the surface of the aluminum sheet is arranged in accordance with 5 relative parallel concave and convex patterns, and each pattern and other patterns have 60-80 degrees Angle, so this kind of pattern has excellent antiskid performance, so it is widely used in architecture (floor) platform design, at the same time the price is cheap. The five bar aluminum alloy tread plate can be divided into two models: big five bar aluminum alloy tread plate and small five bar aluminum alloy tread plate. The difference between them is the height and length of the pattern, the length of small five bar aluminum tread plate is around 30 mm, while the length of big five bar aluminum tread plate is about 40 mm, the arrangement of the 5 bars and the raw material is the same. As the five bar aluminum tread plate[/url] has the advantages of elegant appearance and good skid-proof performance, it becomes the most popular type, Haomei has more than 20 years experience on producing [url=http://thick-aluminum-plate.com/five-bars-aluminum-tread-plate.html]five bar aluminum tread plate, which can offer you the best goods and service. Aluminum tread plate pattern of Haomei are delivered to many countries all over the world, you can see our aluminum tread plate everywhere if you go out side. With Haomei aluminum tread plate, you do not need to worry about the supply and quality of goods any more, if you can give a chance to Haomei, Haomei can return you with best service, helping you to solve your problem is our task forever.